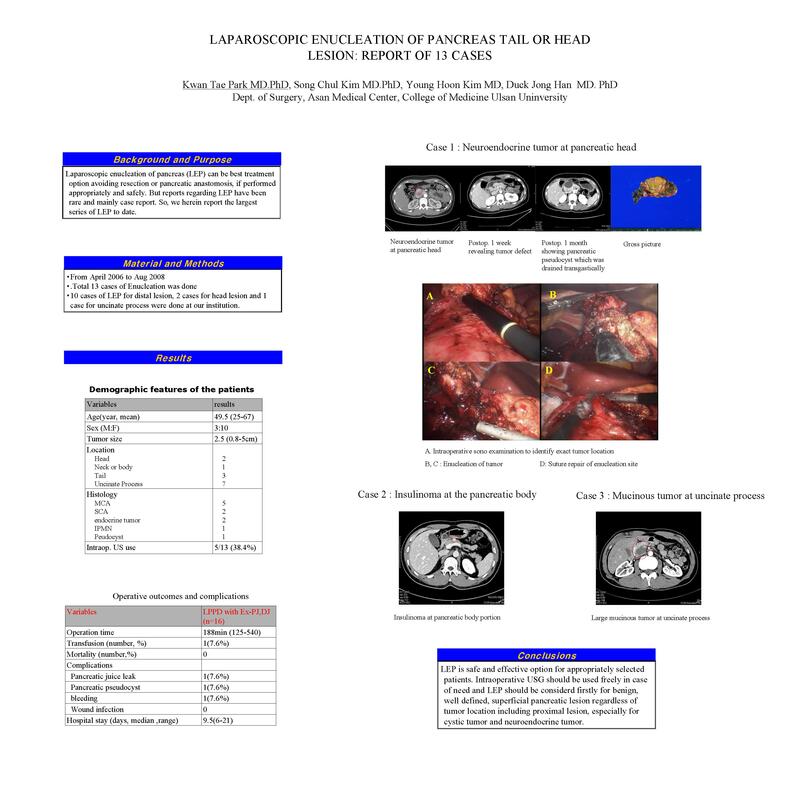 Introduction) Laparoscopic enucleation of pancreas (LEP) can be best treatment option avoiding resection or pancreatic anastomosis, if performed appropriately and safely. But reports regarding LEP have been rare and mainly case report. So, we herein report the largest series of LEP to date. Method) From April 2006 to Aug 2008, total 13 cases of LEP were performed for various pancreatic tumors. 10 cases of LEP for distal lesion, 2 cases for head lesion and 1 case for uncinate process were done at our institution. Results) Final diagnosis were 5 mucinous cystadenoma, 2 serous cystadenoma, 2 islet cell tumor, 2 insulinoma, 1 IPMN and 1 pseudocyst. In 5 patients (38.4) intraoperative USG was used to detect and confirm the tumor location and then to verify mainduct injury. There was no main duct injury and only 1 pancreatic juice leak was developed in the case of insulinoma at pancreas head, which was drained externally. Mean operative time was 188min (125-240) and mean hospital stay was 9.5 days (6-21). Conclusions) LEP is safe and effective option for appropriately selected patients. Intraoperative USG should be used freely in case of need and LEP should be considerd firstly for benign, well defined, superficial pancreatic lesion regardless of tumor location including proximal lesion, especially for cystic tumor and neuroendocrine tumor.